I was lucky enough to get an ARC of this very interesting book. From the time I read the blurb, I knew it would be a story worth reading. I'm happy to say that I was right. Robert Jackson Bennett's debut is set in a bleak world with vivid imagery. Marcus Connelly is just like every other vagrant moving from one side of a dying country to the other. He walks or uses the train--stowing away whenever he can. However, most are looking for a better place to live, somewhere to work and find food to sate their endless hunger. Connelly only wants one thing: revenge on the scarred man who ruined his life. The man with a scarred face killed his young daughter, which in turn destroyed his marriage by consuming his life. Revenge burns within him so bright that until he kills the man responsible, he doesn't think his life will be peaceful again. Connelly even tries to convince himself that once the deed is done, he can return to his wife and resume their life together. Along the way, in pursuit of the scarred man, he finds a group of men also seeking him. So they decide to travel together--Connelly, Pike, Hammond and Roosevelt. The farther they go, the weirder the encounters and the more the legend of the mysterious scarred man deepens. No matter where they go, someone's seen the man pass by, which makes it very easy to follow close behind. There are also countless stories, myths, and eventually even a conspiracy surrounding the man. He seems untouchable, one wicked dude whose only purpose is destruction. Everywhere he goes, things seem to die. I found myself totally sucked into this book from the very beginning. So much that I didn't want to put it down. The narration--in Connelly's point of view--moved at a very steady pace, slowly peeling away layers about Marcus Connelly, what he was up against, the past that shaped him into the shadow of a man he'd become, and just how quickly his descend into darkness sweeps over him. It was an interesting study of how such a dark ambition can turn the nicest and simplest of man into a warped and demented version of himself. Even the stories he hears about the scarred man show his change. At first he only accepts real stories, denying myths of the dark power he possesses, but after everything Connelly sees, his view of the world shifts into an almost supernatural view. 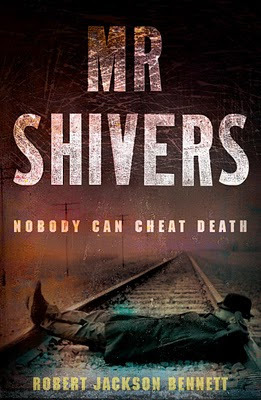 Mr Shivers is a haunting, atmospheric, grim story set in a ruined and rusty, dying world. The devastation and desperation of every character is so well drawn that I felt it every step of the way. And I knew pretty early on that there was no way Connelly would ever end up in a good place. So, I enjoyed the ending. I also loved that I could almost taste the dusty backdrop of an America now washed away by red dirt. This one's a keeper! And I'll be looking out for more books by Robert Jackson Bennett.